Doing some maintenance now due to Recent problems with blogspot.com. This is just a copy of a previous posting that I am working on. Link here: Jesus Yeshua Messiah : Old Testament - Jewish Scriptures [Tanakh] spoke of Jesus Yeshua before he was born. Please scroll down to green Topic links to the right. I will eventually remove this copy. Douglas, if you read this please e-mail me! I am praying for you continually. God is real and so is heaven and hell. Check out the WELCOME above. Also . . . .
And keep scrolling down to find the links to the right for Heaven and Hell testimonies. I also recommend Forgive - And then God will Forgive You- God Forgives and Forgets your Sin ! . This is the most popular page on this site. It is also VERY important! Also check out the Prayer of Salvation to the right. 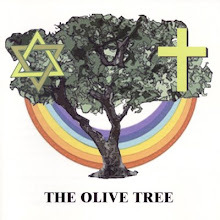 Though the 1st and 2nd coming of Jesus, the Jewish Messiah, was foretold in the Jewish holy scriptures, (the Old Testament) even the disciples had to have their minds miraculously open to make these connections. During Jesus' ministry, the disciples struggled to understand the parables. But remember, the Bible tells us that the things of God are Spirit and that we need the Spirit to understand them. It was not until after Jesus died and ascended into heaven that the Holy Spirit was given. This is a reminder to us that we must not only believe but we must be sure to ask for God's Holy Spirit to indwell us to help us to understand the things of God. The term "Bible" is more commonly used by non-Jews (Gentiles), as are the terms "Old Testament" and "New Testament." 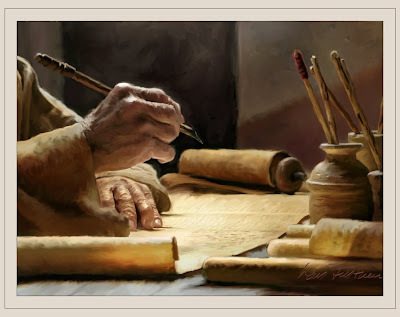 Most of the Old Testament is sacred Hebrew scripture, the Hebrew Written Law. The appropriate term for Jews to use for these writings is the Tanakh. Tanakh is an acronym for: Torah (also known as the Chumash, Pentateuch or Five Books of Moses); Nevi'im (Prophets); and Ketuvim (Writings). However the term "Torah" can also mean the entire corpus of Jewish law. This includes the Written and the Oral Law, which includes the Mishna, the Midrash, the Talmud and even later day legal commentaries. This definition of Torah is probably the most common among Orthodox Jews. Usually you can figure out which definition is being used by the context. 19 And we have the word of the prophets made more certain, and you will do well to pay attention to it, as to a light shining in a dark place, until the day dawns and the morning star rises in your hearts. 20 Above all, you must understand that no prophecy of Scripture came about by the prophet's own interpretation. 21 For prophecy never had its origin in the will of man, but men spoke from God as they were carried along by the Holy Spirit. 1 Now when he [Jesus] saw the crowds, he went up on a mountainside and sat down. His disciples came to him, 2 and he began to teach them saying . . .
17 "Do not think that I have come to abolish the Law or the Prophets [Old Testament] ; I have not come to abolish them but to fulfill them. 18 I tell you the truth, until heaven and earth disappear, not the smallest letter, not the least stroke of a pen, will by any means disappear from the Law until everything is accomplished. 19 Anyone who breaks one of the least of these commandments and teaches others to do the same will be called least in the kingdom of heaven, but whoever practices and teaches these commands will be called great in the kingdom of heaven. 20 For I tell you that unless your righteousness surpasses that of the Pharisees and the teachers of the law, you will certainly not enter the kingdom of heaven. 13 Now that same day two of them were going to a village called Emmaus, about seven miles from Jerusalem. 14 They were talking with each other about everything that had happened. [Jesus had been crucified but they had not yet heard of the resurrection] 15 As they talked and discussed these things with each other, Jesus himself came up and walked along with them; 16 but they were kept from recognizing him. . . .
25 He [Jesus] said to them, "How foolish you are, and how slow of heart to believe all that the prophets have spoken! 26 Did not the Christ [Or Messiah] have to suffer these things and then enter his glory?" 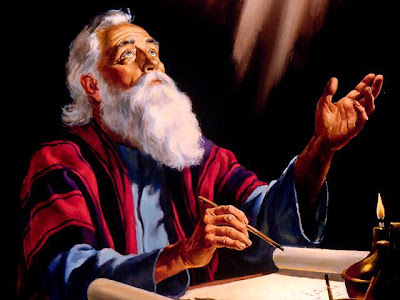 27 And beginning with Moses and all the Prophets, he explained to them what was said in all the Scriptures concerning himself. 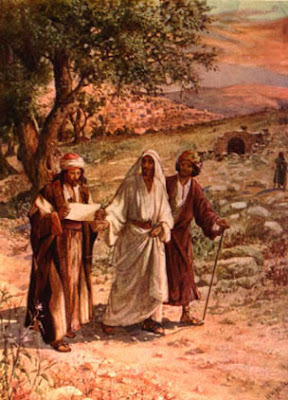 28 As they approached the village to which they were going, Jesus acted as if he were going farther. 29 But they urged him strongly, "Stay with us, for it is nearly evening; the day is almost over." So he went in to stay with them. 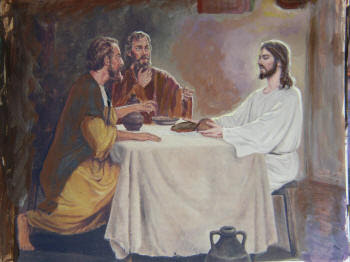 30 When he was at the table with them, he took bread, gave thanks, broke it and began to give it to them. 31 Then their eyes were opened and they recognized him, and he disappeared from their sight. 32 They asked each other, "Were not our hearts burning within us while he talked with us on the road and opened the Scriptures to us?" . . . 44 He said to them, "This is what I told you while I was still with you: Everything must be fulfilled that is written about me in the Law of Moses, the Prophets and the Psalms." 45 Then he opened their minds so they could understand the Scriptures. 14 I admit that I [Paul] worship the God of our fathers as a follower of the Way, which they call a sect. 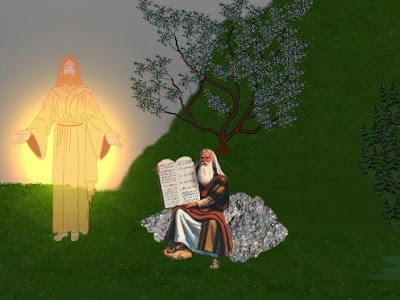 I believe everything that agrees with the Law and that is written in the Prophets, 15 and I have the same hope in God as these men, that there will be a resurrection of both the righteous and the wicked. 16 So I strive always to keep my conscience clear before God and man. . . . Paul Preaches at Rome Under Guard 17 Three days later he called together the leaders of the Jews. When they had assembled, Paul said to them: "My brothers, although I have done nothing against our people or against the customs of our ancestors, I was arrested in Jerusalem and handed over to the Romans. 18 They examined me and wanted to release me, because I was not guilty of any crime deserving death. 19 But when the Jews objected, I was compelled to appeal to Caesar—not that I had any charge to bring against my own people. 20 For this reason I have asked to see you and talk with you. It is because of the hope of Israel that I am bound with this chain." 21 They replied, "We have not received any letters from Judea concerning you, and none of the brothers who have come from there has reported or said anything bad about you. 22 But we want to hear what your views are, for we know that people everywhere are talking against this sect." 17 The LORD said to me: “What they say is good. 18 I will raise up for them a prophet like you from among their brothers; I will put my words in his mouth, and he will tell them everything I command him. 19 If anyone does not listen to my words that the prophet speaks in my name, I myself will call him to account. 4 "The Jews all know the way I [Paul] have lived ever since I was a child, from the beginning of my life in my own country, and also in Jerusalem. 5 They have known me for a long time and can testify, if they are willing, that according to the strictest sect of our religion, I lived as a Pharisee. 6 And now it is because of my hope in what God has promised our fathers that I am on trial today. 7 This is the promise our twelve tribes are hoping to see fulfilled as they earnestly serve God day and night. O king, it is because of this hope that the Jews are accusing me. 8 Why should any of you consider it incredible that God raises the dead? . . .
22 But I have had God's help to this very day, and so I stand here and testify to small and great alike. I am saying nothing beyond what the prophets and Moses said would happen— 23 that the Christ [Or Messiah] would suffer and, as the first to rise from the dead, would proclaim light to his own people and to the Gentiles." 25 Now there was a man in Jerusalem called Simeon, who was righteous and devout. He was waiting for the consolation of Israel, and the Holy Spirit was upon him. 26 It had been revealed to him by the Holy Spirit that he would not die before he had seen the Lord's Christ [Messiah] . 27 Moved by the Spirit, he went into the temple courts. When the parents brought in the child Jesus to do for him what the custom of the Law required, 28 Simeon took him in his arms and praised God, saying: 29 "Sovereign Lord, as you have promised, you now dismiss your servant in peace. 30 For my eyes have seen your salvation, 31 which you have prepared in the sight of all people, 32 a light for revelation to the Gentiles and for glory to your people Israel." 3 He answered, "Haven't you read what David did when he and his companions were hungry? 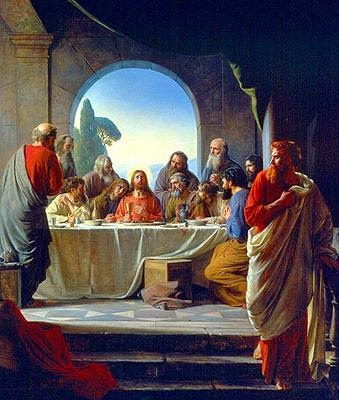 4 He entered the house of God, and he and his companions ate the consecrated bread—which was not lawful for them to do, but only for the priests. 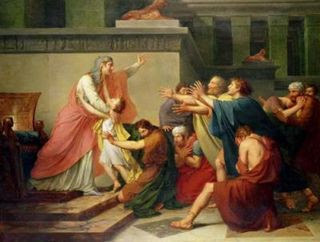 5 Or haven't you read in the Law that on the Sabbath the priests in the temple desecrate the day and yet are innocent? 6 I tell you that one greater than the temple is here. 7 If you had known what these words mean, 'I desire mercy, not sacrifice,'[Hosea 6:6] you would not have condemned the innocent. 8 For the Son of Man is Lord of the Sabbath." Read in context below 6. 6 “I, the LORD, have called you in righteousness; I will take hold of your hand. I will keep you and will make you to be a covenant for the people and a light for the Gentiles, 7 to open eyes that are blind, to free captives from prison and to release from the dungeon those who sit in darkness. 1 Listen to me, you islands; hear this, you distant nations: Before I was born the LORD called me; from my birth he has made mention of my name. 2 He made my mouth like a sharpened sword, in the shadow of his hand he hid me; he made me into a polished arrow and concealed me in his quiver. 6 When the woman saw that the fruit of the tree was good for food and pleasing to the eye, and also desirable for gaining wisdom, she took some and ate it. She also gave some to her husband, who was with her, and he ate it. . . .
Read related scripture directly below 6. 1 What I am saying is that as long as the heir is a child, he is no different from a slave, although he owns the whole estate. 2 He is subject to guardians and trustees until the time set by his father. 3 So also, when we were children, we were in slavery under the basic principles of the world. 4 But when the time had fully come, God sent his Son, born of a woman, born under law, 5 to redeem those under law, that we might receive the full rights of sons. 6 Because you are sons, God sent the Spirit of his Son into our hearts, the Spirit who calls out, "Abba [Aramaic for Father], Father." 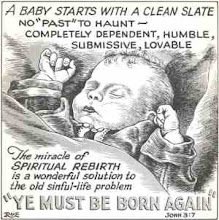 7 So you are no longer a slave, but a son; and since you are a son, God has made you also an heir. 16 The promises were spoken to Abraham and to his seed. The Scripture does not say "and to seeds," meaning many people, but "and to your seed," meaning one person, who is Christ. 17 What I mean is this: The law, introduced 430 years later, does not set aside the covenant previously established by God and thus do away with the promise. 18 For if the inheritance depends on the law, then it no longer depends on a promise; but God in his grace gave it to Abraham through a promise. 1 Then Jacob called for his sons and said: “Gather around so I can tell you what will happen to you in days to come. 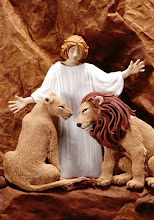 2 “Assemble and listen, sons of Jacob; listen to your father Israel. . . .
8 “Judah, [Jesus was from the tribe of Judah] your brothers will praise you; your hand will be on the neck of your enemies; your father’s sons will bow down to you. 9 You are a lion’s cub, O Judah; you return from the prey, my son. Like a lion he crouches and lies down, like a lioness—who dares to rouse him? 10 The scepter will not depart from Judah, nor the ruler’s staff from between his feet, until he comes to whom it belongs and the obedience of the nations is his. 11 He will tether his donkey to a vine, his colt to the choicest branch; he will wash his garments in wine, his robes in the blood of grapes. 12 His eyes will be darker than wine, his teeth whiter than milk. Revelation 5: 1-5 1 Then I saw in the right hand of him who sat on the throne a scroll with writing on both sides and sealed with seven seals. 2 And I saw a mighty angel proclaiming in a loud voice, "Who is worthy to break the seals and open the scroll?" 3 But no one in heaven or on earth or under the earth could open the scroll or even look inside it. 4 I wept and wept because no one was found who was worthy to open the scroll or look inside. 5 Then one of the elders said to me, "Do not weep! 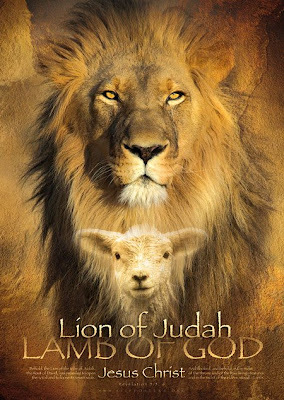 See, the Lion of the tribe of Judah, the Root of David, has triumphed. He is able to open the scroll and its seven seals." Revelation 19: 11-16 11 I saw heaven standing open and there before me was a white horse, whose rider is called Faithful and True. With justice he judges and makes war. 12 His eyes are like blazing fire, and on his head are many crowns. He has a name written on him that no one knows but he himself. 13 He is dressed in a robe dipped in blood, and his name is the Word of God. 14 The armies of heaven were following him, riding on white horses and dressed in fine linen, white and clean. 15 Out of his mouth comes a sharp sword with which to strike down the nations. "He will rule them with an iron scepter. "[Psalm 2:9] He treads the winepress of the fury of the wrath of God Almighty. 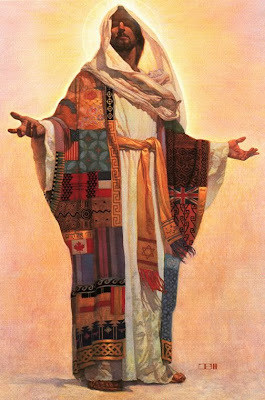 16 On his robe and on his thigh he has this name written: KING OF KINGS AND LORD OF LORDS. 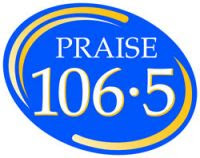 67 His father Zechariah [Father of John the Baptist] was filled with the Holy Spirit and prophesied: 68 "Praise be to the Lord, the God of Israel, because he has come and has redeemed his people. 69 He has raised up a horn [Horn here symbolizes strength] of salvation for us in the house of his servant David 70 (as he said through his holy prophets of long ago), 71 salvation from our enemies and from the hand of all who hate us— 72 to show mercy to our fathers and to remember his holy covenant, 73 the oath he swore to our father Abraham: 74 to rescue us from the hand of our enemies, and to enable us to serve him without fear 75 in holiness and righteousness before him all our days. 76 And you, my child [John the Baptist] , will be called a prophet of the Most High; for you will go on before the Lord to prepare the way for him, 77 to give his people the knowledge of salvation through the forgiveness of their sins, 78 because of the tender mercy of our God, by which the rising sun will come to us from heaven 79 to shine on those living in darkness and in the shadow of death, to guide our feet into the path of peace." 1 Paul, a servant of Christ Jesus, called to be an apostle and set apart for the gospel of God— 2 the gospel he promised beforehand through his prophets in the Holy Scriptures 3 regarding his Son, who as to his human nature was a descendant of David, 4 and who through the Spirit of holiness was declared with power to be the Son of God by his resurrection from the dead: Jesus Christ our Lord. 5 Through him and for his name's sake, we received grace and apostleship to call people from among all the Gentiles to the obedience that comes from faith. 6 And you also are among those who are called to belong to Jesus Christ. 10 And I will provide a place for my people Israel and will plant them so that they can have a home of their own and no longer be disturbed. Wicked people will not oppress them anymore, as they did at the beginning 11 and have done ever since the time I appointed leaders [judges] over my people Israel. I will also give you rest from all your enemies. 13 For the LORD has chosen Zion, he has desired it for his dwelling: 14 “This is my resting place for ever and ever [ Revelation 22: 3-5 3 No longer will there be any curse. The throne of God and of the Lamb will be in the city, and his servants will serv e him. 4They will see his face, and his name will be on their foreheads. 5 There will be no more night. They will not need the light of a lamp or the light of the sun, for the Lord God will give them light. And they will reign for ever and ever. ] ; here I will sit enthroned, for I have desired it— 15 I will bless her with abundant provisions; her poor will I satisfy with food. 16 I will clothe her priests with salvation, and her saints will ever sing for joy. 17 “Here I will make a horn [ Horn here symbolizes strong one, that is, king ] grow for David and set up a lamp for my anointed one. 5 “The days are coming,” declares the LORD, “when I will raise up to David [Or up from David’s line] a righteous Branch, a King who will reign wisely and do what is just and right in the land. 6 In his days Judah will be saved and Israel will live in safety. This is the name by which he will be called: The LORD Our Righteousness. . . "
—which means, "God with us." 4 So Joseph [Jesus' earthly father] also went up from the town of Nazareth in Galilee to Judea, to Bethlehem the town of David [David was born in Bethlehem], because he belonged to the house and line of David. 5 He went there to register with Mary, who was pledged to be married to him and was expecting a child. 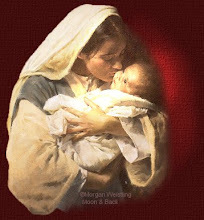 6 While they were there, the time came for the baby to be born, 7 and she gave birth to her firstborn, a son. 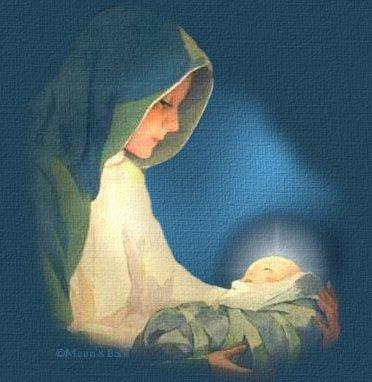 She wrapped him in cloths and placed him in a manger, because there was no room for them in the inn. The Shepherds and the Angels 8 And there were shepherds living out in the fields nearby, keeping watch over their flocks at night. 9 An angel of the Lord appeared to them, and the glory of the Lord shone around them, and they were terrified. 10 But the angel said to them, "Do not be afraid. I bring you good news of great joy that will be for all the people. 11 Today in the town of David a Savior has been born to you; he is Christ (Greek) [ or Messiah (Hebrew) - both mean The Annointed One] the Lord. 12 This will be a sign to you: You will find a baby wrapped in cloths and lying in a manger." 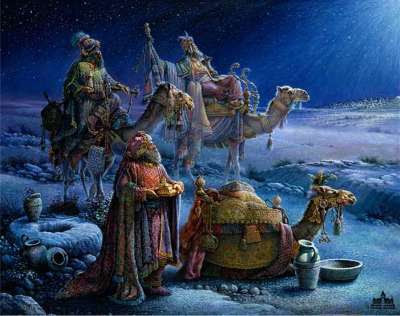 1 After Jesus was born in Bethlehem [in Hebrew means "House of Bread"] in Judea, during the time of King Herod, Magi [Traditionally Wise Men] from the east came to Jerusalem 2 and asked, "Where is the one who has been born king of the Jews? 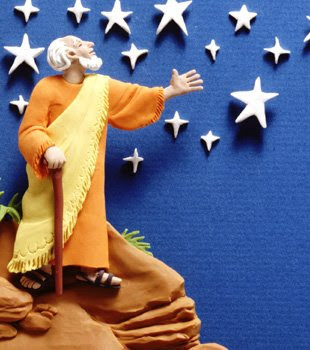 We saw his star in the east and have come to worship him." 6 " 'But you, Bethlehem, in the land of Judah, are by no means least among the rulers of Judah; for out of you will come a ruler who will be the shepherd of my people Israel. '[Micah 5:2]"
37 On the last and greatest day of the Feast [ of Tabernacles] , Jesus stood and said in a loud voice, "If anyone is thirsty, let him come to me and drink. 38 Whoever believes in me, as the Scripture has said, streams of living water will flow from within him." 39 By this he meant the Spirit, whom those who believed in him were later to receive. Up to that time the Spirit had not been given, since Jesus had not yet been glorified. 41 Others said, "He is the Christ." Still others asked, "How can the Christ come from Galilee? 42 Does not the Scripture say that the Christ will come from David's family [seed] and from Bethlehem, the town where David lived?" 43 Thus the people were divided because of Jesus. 44 Some wanted to seize him, but no one laid a hand on him. 1 Marshal your troops, O city of troops, for a siege is laid against us. They will strike Israel's ruler on the cheek with a rod. 2 " But you, Bethlehem Ephrathah, though you are small among the clans of Judah, out of you will come for me one who will be ruler over Israel, whose origins are from of old, from ancient times. [Or from days of eternity ] " 3 Therefore Israel will be abandoned until the time when she who is in labor gives birth and the rest of his brothers return to join the Israelites. 4 He will stand and shepherd his flock in the strength of the LORD, in the majesty of the name of the LORD his God. And they will live securely, for then his greatness will reach to the ends of the earth. 5 And he will be their peace. The Return to Nazareth 19 After Herod died, an angel of the Lord appeared in a dream to Joseph in Egypt 20 and said, "Get up, take the child and his mother and go to the land of Israel, for those who were trying to take the child's life are dead." 44 Philip, like Andrew and Peter, was from the town of Bethsaida. 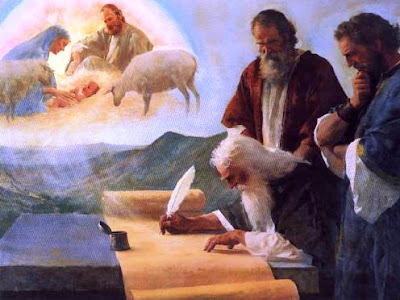 45 Philip found Nathanael and told him, "We have found the one Moses wrote about in the Law, and about whom the prophets also wrote [the Old Testament /Torah, Prophets, Writings] —Jesus of Nazareth, the son of Joseph." ; your throne will be established forever.' " . 17 From that time on Jesus began to preach, "Repent, for the kingdom of heaven is near." 1 Nevertheless, there will be no more gloom for those who were in distress. In the past he humbled the land of Zebulun and the land of Naphtali, but in the future he will honor Galilee of the Gentiles, by the way of the sea, along the Jordan-2 The people walking in darkness have seen a great light; on those living in the land of the shadow of death a light has dawned. 3 You have enlarged the nation and increased their joy; they rejoice before you as people rejoice at the harvest, as men rejoice when dividing the plunder. "He took up our infirmities and carried our diseases." [Isaiah 53:4] . 26 Jesus answered, "I tell you the truth, you are looking for me, not because you saw miraculous signs but because you ate the loaves and had your fill. 27 Do not work for food that spoils, but for food that endures to eternal life, which the Son of Man will give you. On him God the Father has placed his seal of approval." 41 At this the Jews began to grumble about him because he said, "I am the bread that came down from heaven." 42 They said, "Is this not Jesus, the son of Joseph, whose father and mother we know? How can he now say, 'I came down from heaven'?" Everyone who listens to the Father and learns from him comes to me. 46 No one has seen the Father except the one who is from God; only he has seen the Father. 47 I tell you the truth, he who believes has everlasting life. 48 I am the bread of life. 49 Your forefathers ate the manna in the desert, yet they died. 50 But here is the bread that comes down from heaven, which a man may eat and not die. 51 I am the living bread that came down from heaven. If anyone eats of this bread, he will live forever. This bread is my flesh, which I will give for the life of the world." whom I delight; I will put my Spirit on him, and he will proclaim justice to the nations. 19 He will not uarrel or cry out; no one will hear his voice in the streets. 20 A bruised reed he will not break, and a smoldering wick he will not snuff out, till he leads justice to victory. 21 In his name the nations will put their hope. "[Isaiah 42:1-4] . 10 The disciples came to him and asked, "Why do you speak to the people in parables? " " 'You will be ever hearing but never understanding; you will be ever seeing but never perceiving. 18 "Listen then to what the parable of the sower means: . . . .
36 Then he left the crowd and went into the house. His disciples came to him and said, "Explain to us the parable of the weeds in the field." . . . . 51 "Have you understood all these things?" Jesus asked. "Yes," they replied. 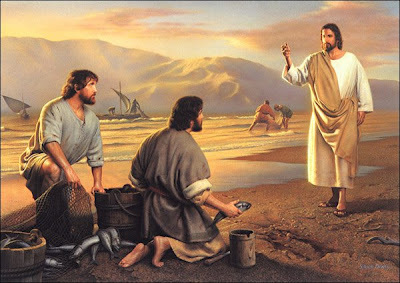 52 He said to them, "Therefore every teacher of the law who has been instructed about the kingdom of heaven is like the owner of a house who brings out of his storeroom new treasures as well as old." 31 At that time some Pharisees came to Jesus and said to him, "Leave this place and go somewhere else. Herod wants to kill you." 32 He replied, "Go tell that fox, 'I will drive out demons and heal people today and tomorrow, and on the third day I will reach my goal.' 33 In any case, I must keep going today and tomorrow and the next day—for surely no prophet can die outside Jerusalem! 'Blessed is he who comes in the name of the Lord. '[Psalm 118:26]"
28 After Jesus had said this, he went on ahead, going up to Jerusalem. 29 As he approached Bethphage and Bethany at the hill called the Mount of Olives, he sent two of his disciples, saying to them, 30 "Go to the village ahead of you, and as you enter it, you will find a colt tied there, which no one has ever ridden. Untie it and bring it here. 31 If anyone asks you, 'Why are you untying it?' tell him, 'The Lord needs it.' "
32 Those who were sent ahead went and found it just as he had told them. 33 As they were untying the colt, its owners asked them, "Why are you untying the colt?" 34 They replied, "The Lord needs it." 37 When he came near the place where the road goes down the Mount of Olives, the whole crowd of disciples began joyfully to praise God in loud voices for all the miracles they had seen: "Peace in heaven and glory in the highest!" 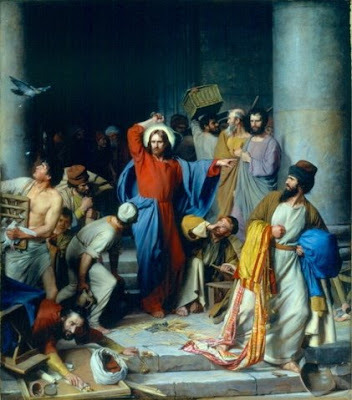 39 Some of the Pharisees in the crowd said to Jesus, "Teacher, rebuke your disciples!" 40 "I tell you," he replied, "if they keep quiet, the stones will cry out." 41 As he approached Jerusalem and saw the city, he wept over it 42 and said, "If you, even you, had only known on this day what would bring you peace—but now it is hidden from your eyes. 43 The days will come upon you when your enemies will build an embankment against you and encircle you and hem you in on every side. 44 They will dash you to the ground, you and the children within your walls. They will not leave one stone on another, because you did not recognize the time of God's coming to you." 12 The next day the great crowd that had come for the Feast heard that Jesus was on his way to Jerusalem. 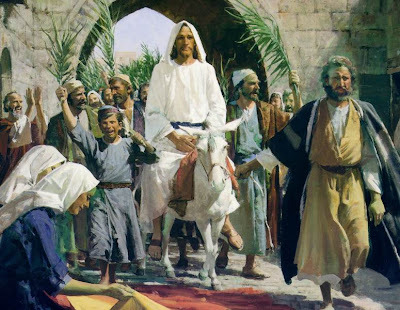 13 They took palm branches and went out to meet him, shouting, "Hosanna!" 20 This is the gate of the LORD through which the righteous may enter. [Read topic link Jesus : The Gate - The Door - The Way ] 21 I will give you thanks, for you answered me; you have become my salvation. 22 The stone the builders rejected has become the capstone; [Read topic link Jesus : the Rock /Living Stone / the Stone the Builders rejected /the Stumble Stone became the Capstone (Cornerstone) ] 23 the LORD has done this, and it is marvelous in our eyes. 25 O LORD, save us; O LORD, grant us success. 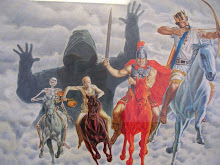 10 I will take away the chariots from Ephraim and the war-horses from Jerusalem, and the battle bow will be broken. He will proclaim peace to the nations. His rule will extend from sea to sea and from the River to the ends of the earth. 12 Return to your fortress [Read topic links Rock / Fortress in Old Testament and Jesus : the Rock /Living Stone / the Stone the Builders rejected /the Stumble Stone became the Capstone (Cornerstone) ] , O prisoners of hope; even now I announce that I will restore twice as much to you. 5 " Say to the Daughter of Zion, 'See, your king comes to you, gentle and riding on a donkey, on a colt, the foal of a donkey.' "[ Zech. 9:9] . 6 The disciples went and did as Jesus had instructed them. 7 They brought the donkey and the colt, placed their cloaks on them, and Jesus sat on them. 8 A very large crowd spread their cloaks on the road, while others cut branches from the trees and spread them on the road. 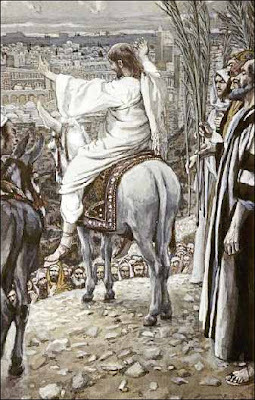 9 The crowds that went ahead of him and those that followed shouted, "Hosanna to the Son of David!" 4 They went and found a colt outside in the street, tied at a doorway. As they untied it, 5 some people standing there asked, "What are you doing, untying that colt?" 6 They answered as Jesus had told them to, and the people let them go. 7 When they brought the colt to Jesus and threw their cloaks over it, he sat on it. 8 Many people spread their cloaks on the road, while others spread branches they had cut in the fields. 9 Those who went ahead and those who followed shouted, "Hosanna! [A Hebrew expression meaning "Save!" ]"
10 "Blessed is the coming kingdom of our father David!" "Hosanna in the highest!" 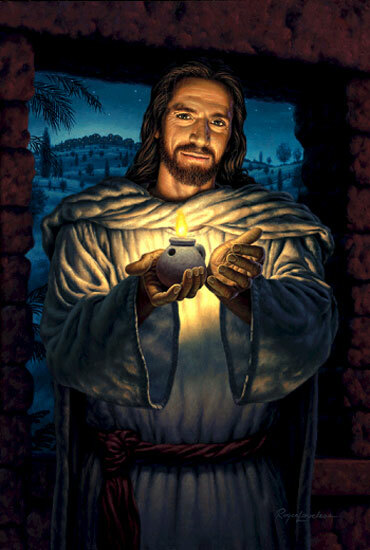 11 Jesus entered Jerusalem and went to the temple. He looked around at everything, but since it was already late, he went out to Bethany with the Twelve.
" 'My house will be called a house of prayer,' [Isaiah 56:7] but you are making it a 'den of robbers. 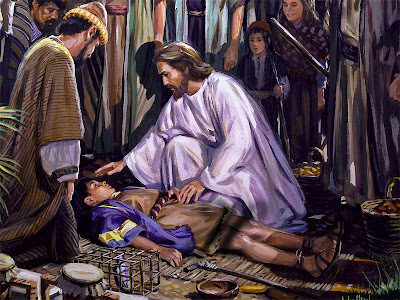 '[Jeremiah 7:11] "
14 The blind and the lame came to him at the temple, and he healed them. 15 But when the chief priests and the teachers of the law saw the wonderful things he did and the children shouting in the temple area, "Hosanna to the Son of David," they were indignant. 16 "Do you hear what these children are saying?" they asked him. "Yes," replied Jesus, "have you never read, "
35 "The tenants seized his servants; they beat one, killed another, and stoned a third. 36 Then he sent other servants to them, more than the first time, and the tenants treated them the same way. 37 Last of all, he sent his son to them. 'They will respect my son,' he said. 40"Therefore, when the owner of the vineyard comes, what will he do to those tenants?" 41"He will bring those wretches to a wretched end," they replied, "and he will rent the vineyard to other tenants, who will give him his share of the crop at harvest time." cornerstone] ; the Lord has done this, and it is marvelous in our eyes'[Psalm 118:22-23] ? 43"Therefore I tell you that the kingdom of God will be taken away from you and given to a people who will produce its fruit. 44 He who falls on this stone will be broken to pieces, but he on whom it falls will be crushed." The Last Supper 7 Then came the day of Unleavened Bread on which the Passover lamb had to be sacrificed. 8 Jesus sent Peter and John, saying, "Go and make preparations for us to eat the Passover."
. . . 14 When the hour came, Jesus and his apostles reclined at the table. 15 And he said to them, "I have eagerly desired to eat this Passover with you before I suffer. 16 For I tell you, I will not eat it again until it finds fulfillment in the kingdom of God." 31 Then Jesus told them, "This very night you will all fall away on account of me, for it is written: "
32 But after I have risen, I will go ahead of you into Galilee." . . .
Judas Hangs Himself 1 Early in the morning, all the chief priests and the elders of the people came to the decision to put Jesus to death. 2 They bound him, led him away and handed him over to Pilate, the governor. 3 When Judas, who had betrayed him, saw that Jesus was condemned, he was seized with remorse and returned the thirty silver coins to the chief priests and the elders. 4 "I have sinned," he said, "for I have betrayed innocent blood." "What is that to us?" they replied. "That's your responsibility." 6 The chief priests picked up the coins and said, "It is against the law to put this into the treasury, since it is blood money." 7 So they decided to use the money to buy the potter's field as a burial place for foreigners. 8 That is why it has been called the Field of Blood to this day. 9. 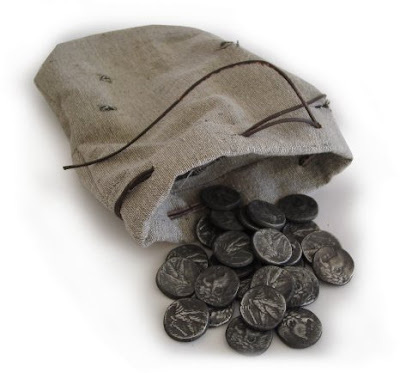 Then what was spoken by Jeremiah the prophet was fulfilled: "They took the thirty silver coins, the price set on him by the people of Israel, 10 and they used them to buy the potter's field, as the Lord commanded me. "[See Zech. 11:12,13 ; Jer. 19:1-13; 32:6-9] . 25 "Know and understand this: From the issuing of the decree to restore and rebuild Jerusalem until the Anointed One, the ruler, comes, there will be seven 'sevens,' and sixty-two 'sevens.' It will be rebuilt with streets and a trench, but in times of trouble. 26 After the sixty-two 'sevens,' the Anointed One will be cut off and will have nothing. The people of the ruler who will come will destroy the city and the sanctuary. The end will come like a flood: War will continue until the end, and desolations have been decreed. 27 He will confirm a covenant with many for one 'seven.' [week ( of years)] In the middle of the 'seven' [week] he will put an end to sacrifice and offering. And on a wing of the temple he will set up an abomination that causes desolation, until the end that is decreed is poured out on him. " It is the only Old Testament passage which refers to the Messiah as “Messiah.” Elsewhere He is called “Shiloh” (Genesis 49:10), the “Root of Jesse” (Isaiah 11:10), the “Righteous Branch” (Jeremiah 23:5), the “Prince of Peace” (Isaiah 9:6), etc. 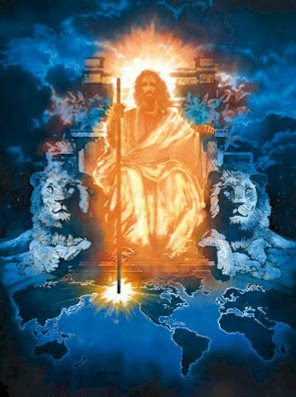 But the name by which He is known best, “Messiah,” appears in only one passage: Daniel 9:24-27 . Nebuchadnezzar had Jerusalem dismantled around 587 BC after having to put down two rebellions there in less than 10 years. At the time this prophecy was given, Jerusalem still lay in ruins. According to the prophecy, from the decree to rebuild Jerusalem there would be seven seven-year periods and sixty-two more seven-year periods—or 483 years—until the Messiah would show up. After the culmination of the 62 seven-year periods, or after 483rd year, the Messiah would be cut off. Both the ancient Hebrews to whom Daniel was writing and the ancient Babylonians to whom he was subservient (Daniel supposedly having been written in Babylon during the latter half of the 6th century BC) used a 360-day year. So, 483 years x 360 days = 173,880 days. This is the equivalent of 476 years and 25 days using our modern Gregorian calendar’s 365.24219879-day year. As for our starting point, the Persian Emperor Artaxerxes Longimanus (who ruled Persia from 464-424 BC) issued the edict to rebuild Jerusalem sometime during the Hebrew month of Nisan in the 20th year of his reign, or 444 BC (Nehemiah 2:1-8). The month of Nisan fell between February 27 (Nisan 1) and March 28 (Nisan 30) of that year according to our modern Gregorian calendar. 173,880 days from February 27 - March 28, 444 BC, lands us at March 24 - April 22, AD 33. According to this prophecy, the Messiah would show up, present Himself as Messiah to the nation and then be “cut off” some time between March 24 and April 22, AD 33. Jesus Christ presented Himself to the nation of Israel on Palm Sunday, March 27, was crucified four days later on April 1, or “Preparation Day” (the annual day on which the Passover Lamb was slain), and rose from the dead on Sunday, April 3, AD 33, all within our 30-day range of dates. The prophecy then goes on to say that subsequent to the Messiah being “cut off,” “the people of the prince who is to come will destroy the city and the sanctuary.” Within one generation of Christ’s crucifixion, Titus razed Jerusalem and destroyed the temple. There is some debate about the exact date of the decree that began the 483 years. There is also debate as to whether the days should be counted on our modern 365-day calendars, or the 360-day lunar calendar that was normally used in ancient times. Whichever the case, Daniel's prophecy concludes very close to the time Jesus Christ was being crucified in Jerusalem. If we knew all the exact dates of Daniel's prophecy and timing, we would find it would land exactly on the very day of Christ's death. Through God revealing it to him, the Prophet Daniel predicted the very day of Christ's death—over 400 years before it occurred. 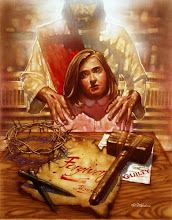 13 See, my servant will act wisely ; he will be raised and lifted up and highly exalted. 14 Just as there were many who were appalled at him [c]—his appearance was so disfigured beyond that of any man and his form marred beyond human likeness— 15 so will he sprinkle many nations, [Hebrew; Septuagint so will many nations marvel at him ] and kings will shut their mouths because of him. For what they were not told, they will see, and what they have not heard, they will understand. Isaiah 53 1 Who has believed our message and to whom has the arm of the LORD been revealed? [John 12:37-38 Even after Jesus had done all these miraculous signs in their presence, they still would not believe in him. This was to fulfill the word of Isaiah the prophet: "Lord, who has believed our message and to whom has the arm of the Lord been revealed?" Romans 10:16 But not all the Israelites accepted the good news. For Isaiah says, "Lord, who has believed our message?" ] 2 He grew up before him like a tender shoot, and like a root out of dry ground. He had no beauty or majesty to attract us to him, nothing in his appearance that we should desire him. 3 He was despised and rejected by men, a man of sorrows, and familiar with suffering. Like one from whom men hide their faces he was despised, and we esteemed him not. [ Mark 9:12 Jesus replied, "To be sure, Elijah does come first, and restores all things. Why then is it written that the Son of Man must suffer much and be rejected? Luke 17:25 But first he must suffer many things and be rejected by this generation. John 1:10-11 He was in the world, and though the world was made through him, the world did not recognize him. He came to that which was his own, but his own did not receive him. 1 Peter 2:4 As you come to him, the living Stone—rejected by men but chosen by God and precious to him— ] 4 Surely he took up our infirmities and carried our sorrows [Matthew 8:16-17 When evening came, many who were demon-possessed were brought to him, and he drove out the spirits with a word and healed all the sick. This was to fulfill what was spoken through the prophet Isaiah: "He took up our infirmities and carried our diseases."] , yet we considered him stricken by God, smitten by him, and afflicted [Galatians 3:13 redeemed us from the curse of the law by becoming a curse for us, for it is written: "Cursed is everyone who is hung on a tree." Matthew 27:38-44 Two robbers were crucified with him, one on his right and one on his left. Those who passed by hurled insults at him, shaking their heads and saying, "You who are going to destroy the temple and build it in three days, save yourself! Come down from the cross, if you are the Son of God!" 10 Yet it was the LORD's will to crush him and cause him to suffer, and though the LORD makes his life a guilt offering [1 Corinthians 15:3 For what I received I passed on to you as of first importance: that Christ died for our sins according to the Scriptures. Hebrews 10:12-14 But when this priest had offered for all time one sacrifice for sins, he sat down at the right hand of God. 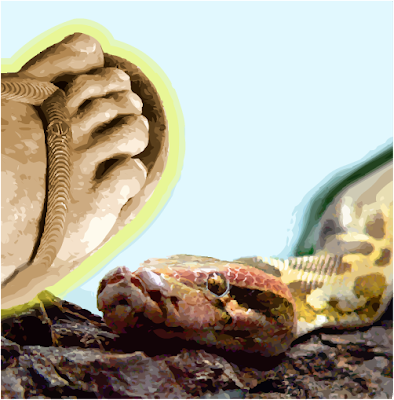 Since that time he waits for his enemies to be made his footstool, because by one sacrifice he has made perfect forever those who are being made holy. ] , he will see his offspring and prolong his days, and the will of the LORD will prosper in his hand. 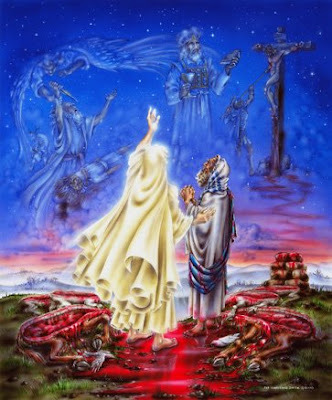 11 After the suffering of his soul, he will see the light of life and be satisfied [Or (with Masoretic Text) 11 He will see the result of the suffering of his soul / and be satisfied] ; by his knowledge [Or by knowledge of him] my righteous servant will justify many [Acts 13:38-39"Therefore, my brothers, I want you to know that through Jesus the forgiveness of sins is proclaimed to you. Through him everyone who believes is justified from everything you could not be justified from by the law of Moses. Romans 5:17-19 For if, by the trespass of the one man, death reigned through that one man, how much more will those who receive God's abundant provision of grace and of the gift of righteousness reign in life through the one man, Jesus Christ. Consequently, just as the result of one trespass was condemnation for all men, so also the result of one act of righteousness was justification that brings life for all men. For just as through the disobedience of the one man the many were made sinners, so also through the obedience of the one man the many will be made righteous. ] , and he will bear their iniquities. 12 Therefore I will give him a portion among the great [Matthew 28:18 Then Jesus came to them and said, "All authority in heaven and on earth has been given to me. ] , and he will divide the spoils with the strong, because he poured out his life unto death, and was numbered with the transgressors. For he bore the sin of many, and made intercession for the transgressors [Luke 23:34 Jesus said, "Father, forgive them, for they do not know what they are doing." Luke 23:39-43 One of the criminals who hung there hurled insults at him: "Aren't you the Christ? Save yourself and us!" But the other criminal rebuked him. "Don't you fear God," he said, "since you are under the same sentence? We are punished justly, for we are getting what our deeds deserve. But this man has done nothing wrong." Then he said, "Jesus, remember me when you come into your kingdom." Jesus answered him, "I tell you the truth, today you will be with me in paradise." Romans 8:34 Christ Jesus, who died—more than that, who was raised to life—is at the right hand of God and is also interceding for us. ] . Two robbers were crucified with him, one on his right and one on his left. Mark 15:27 They crucified two robbers with him, one on his right and one on his left. Luke 23:32-33 Two other men, both criminals, were also led out with him to be executed. When they came to the place called the Skull, there they crucified him, along with the criminals—one on his right, the other on his left. ] and with the rich in his death [Matthew 27:57-60 As evening approached, there came a rich man from Arimathea, named Joseph, who had himself become a disciple of Jesus. Going to Pilate, he asked for Jesus' body, and Pilate ordered that it be given to him. Joseph took the body, wrapped it in a clean linen cloth, and placed it in his own new tomb that he had cut out of the rock. He rolled a big stone in front of the entrance to the tomb and went away. Mark 15:43-46 Joseph of Arimathea, a prominent member of the Council, who was himself waiting for the kingdom of God, went boldly to Pilate and asked for Jesus' body. Pilate was surprised to hear that he was already dead. Summoning the centurion, he asked him if Jesus had already died. When he learned from the centurion that it was so, he gave the body to Joseph. So Joseph bought some linen cloth, took down the body, wrapped it in the linen, and placed it in a tomb cut out of rock. Then he rolled a stone against the entrance of the tomb. Luke 23:50-53 Now there was a man named Joseph, a member of the Council, a good and upright man, who had not consented to their decision and action. He came from the Judean town of Arimathea and he was waiting for the kingdom of God. Going to Pilate, he asked for Jesus' body. Then he took it down, wrapped it in linen cloth and placed it in a tomb cut in the rock, one in which no one had yet been laid. John 19:38-42 Later, Joseph of Arimathea asked Pilate for the body of Jesus. Now Joseph was a disciple of Jesus, but secretly because he feared the Jews. With Pilate's permission, he came and took the body away. 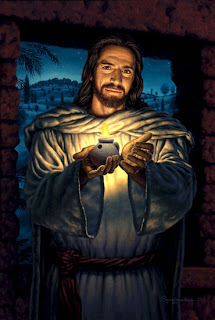 39He was accompanied by Nicodemus, the man who earlier had visited Jesus at night. 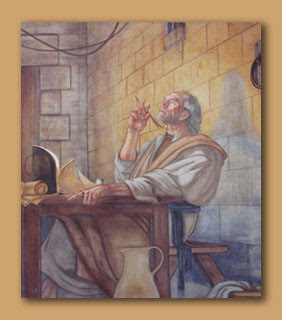 Nicodemus brought a mixture of myrrh and aloes, about seventy-five pounds. Taking Jesus' body, the two of them wrapped it, with the spices, in strips of linen. This was in accordance with Jewish burial customs. At the place where Jesus was crucified, there was a garden, and in the garden a new tomb, in which no one had ever been laid. Because it was the Jewish day of Preparation and since the tomb was nearby, they laid Jesus there. ] , though he had done no violence, nor was any deceit in his mouth [1 Peter 2:21-23 Christ suffered for you, leaving you an example, that you should follow in his steps. "He committed no sin, and no deceit was found in his mouth." When they hurled their insults at him, he did not retaliate; when he suffered, he made no threats ]. "My God, my God, why have you forsaken me? 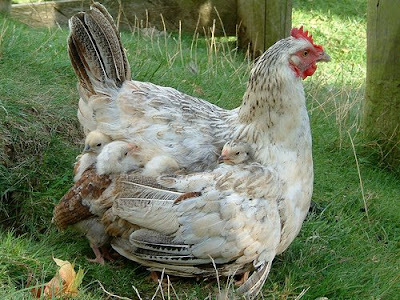 "[Psalm 22:1] See in context directly below . . . . .
51 At that moment the curtain of the temple was torn in two from top to bottom. The earth shook and the rocks split. 52 The tombs broke open and the bodies of many holy people who had died were raised to life. 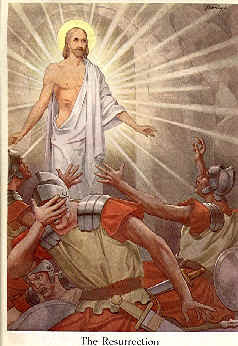 53 They came out of the tombs, and after Jesus' resurrection they went into the holy city and appeared to many people. 54 When the centurion and those with him who were guarding Jesus saw the earthquake and all that had happened, they were terrified, and exclaimed, "Surely he was the Son of God! " Psalm 22: 1-31 Psalms was written about 1020 years prior to Jesus' birth. 1 My God, my God, why have you forsaken me? [Matthew 27:45-46 The Death of Jesus: From the sixth hour until the ninth hour darkness came over all the land. About the ninth hour Jesus cried out in a loud voice, "Eloi, Eloi, lama sabachthani? "—which means, "My God, my God, why have you forsaken me?" , Mark 15:34 The Death of Jesus: At the sixth hour darkness came over the whole land until the ninth hour. And at the ninth hour Jesus cried out in a loud voice, "Eloi, Eloi, lama sabachthani? "—which means, "My God, my God, why have you forsaken me?" ]Why are you so far from saving me, so far from the words of my groaning? 9 Yet you brought me out of the womb; you made me trust in you even at my mother's breast. 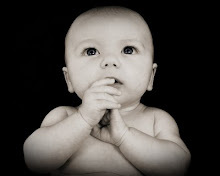 10 From birth I was cast upon you; from my mother's womb you have been my God. 12 Many bulls surround me; strong bulls of Bashan encircle me [ Matthew 27:27-31 Then the governor's soldiers took Jesus into the Praetorium and gathered the whole company of soldiers around him. They stripped him and put a scarlet robe on him, and then twisted together a crown of thorns and set it on his head. 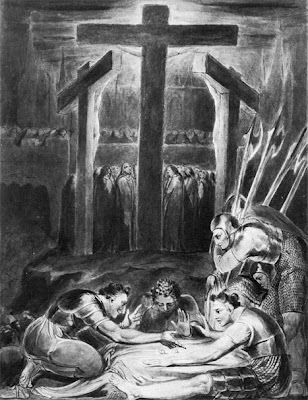 They put a staff in his right hand and knelt in front of him and mocked him. "Hail, king of the Jews!" they said. They spit on him, and took the staff and struck him on the head again and again. After they had mocked him, they took off the robe and put his own clothes on him. 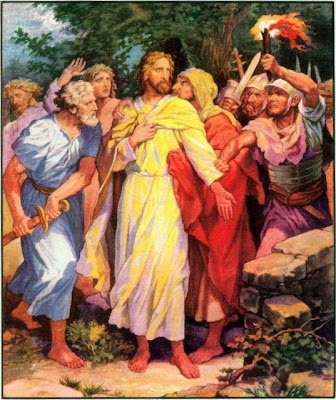 Then they led him away to crucify him. Mark 15:16-20 The soldiers led Jesus away into the palace (that is, the Praetorium) and called together the whole company of soldiers. They put a purple robe on him, then twisted together a crown of thorns and set it on him. And they began to call out to him, "Hail, king of the Jews!" Again and again they struck him on the head with a staff and spit on him. Falling on their knees, they paid homage to him. And when they had mocked him, they took off the purple robe and put his own clothes on him. Then they led him out to crucify him. ]. 15 My strength is dried up like a potsherd [ Matthew 27:32 As they were going out, they met a man from Cyrene, named Simon, and they forced him to carry the cross., Mark 15:21 A certain man from Cyrene, Simon, the father of Alexander and Rufus, was passing by on his way in from the country, and they forced him to carry the cross., Luke 23:26 As they led him away, they seized Simon from Cyrene, who was on his way in from the country, and put the cross on him and made him carry it behind Jesus. ], and my tongue sticks to the roof of my mouth [ John 19:28 Later, knowing that all was now completed, and so that the Scripture would be fulfilled, Jesus said, "I am thirsty." ] ; you lay me in the dust of death. 16 Dogs have surrounded me; a band of evil men has encircled me [Matthew 27:39-44 Those who passed by hurled insults at him, shaking their heads and saying, "You who are going to destroy the temple and build it in three days, save yourself! Come down from the cross, if you are the Son of God!" In the same way the chief priests, the teachers of the law and the elders mocked him. "He saved others," they said, "but he can't save himself! He's the King of Israel! Let him come down now from the cross, and we will believe in him. He trusts in God. Let God rescue him now if he wants him, for he said, 'I am the Son of God.' " In the same way the robbers who were crucified with him also heaped insults on him. ], they have pierced my hands and my feet [John 20:19-20, 24-27 On the evening of that first day of the week, when the disciples were together, with the doors locked for fear of the Jews, Jesus came and stood among them and said, "Peace be with you!" After he said this, he showed them his hands and side. The disciples were overjoyed when they saw the Lord. . . . Now Thomas (called Didymus), one of the Twelve, was not with the disciples when Jesus came. So the other disciples told him, "We have seen the Lord!" 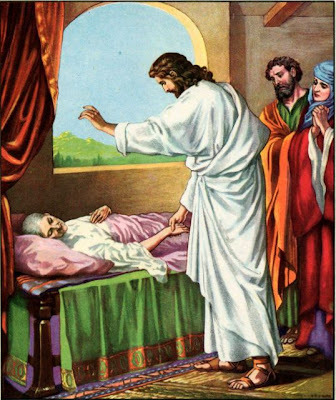 But he said to them, "Unless I see the nail marks in his hands and put my finger where the nails were, and put my hand into his side, I will not believe it." A week later his disciples were in the house again, and Thomas was with them. Though the doors were locked, Jesus came and stood among them and said, "Peace be with you!" Then he said to Thomas, "Put your finger here; see my hands. Reach out your hand and put it into my side. Stop doubting and believe." ]. 17 I can count all my bones [ John 19:31-36 Now it was the day of Preparation, and the next day was to be a special Sabbath. 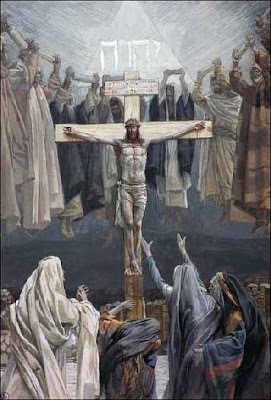 Because the Jews did not want the bodies left on the crosses during the Sabbath, they asked Pilate to have the legs broken and the bodies taken down. The soldiers therefore came and broke the legs of the first man who had been crucified with Jesus, and then those of the other. But when they came to Jesus and found that he was already dead, they did not break his legs. Instead, one of the soldiers pierced Jesus' side with a spear, bringing a sudden flow of blood and water. The man who saw it has given testimony, and his testimony is true. He knows that he tells the truth, and he testifies so that you also may believe. These things happened so that the scripture would be fulfilled: "Not one of his bones will be broken,"(Exodus 12:46; Num. 9:12; Psalm 34:20 ) ]; people stare and gloat over me [ Matthew 27:39-44 (See above) , Luke 23:35 The people stood watching, and the rulers even sneered at him. They said, "He saved others; let him save himself if he is the Christ of God, the Chosen One." ] . 18 They divide my garments among them and cast lots for my clothing [Matthew 27:35 When they [the governor's soldiers ] had crucified him, they divided up his clothes by casting lots. 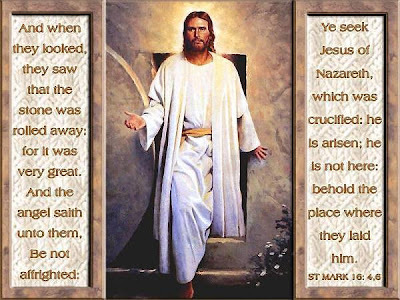 , Mark 15:24 And they crucified him. Dividing up his clothes, they cast lots to see what each would get. , Luke 23:34 Jesus said, "Father, forgive them, for they do not know what they are doing." And they divided up his clothes by casting lots. 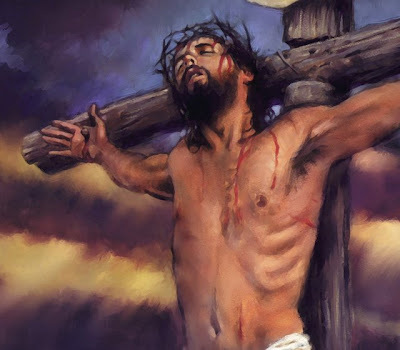 , John 19:23-24 When the soldiers crucified Jesus, they took his clothes, dividing them into four shares, one for each of them, with the undergarment remaining. This garment was seamless, woven in one piece from top to bottom. "Let's not tear it," they said to one another. "Let's decide by lot who will get it." This happened that the scripture might be fulfilled which said, "They divided my garments among them and cast lots for my clothing." So this is what the soldiers did. ]. 22 I will declare your name to my brothers; in the congregation I will praise you. 23 You who fear the LORD, praise him! All you descendants of Jacob, honor him! Revere him, all you descendants of Israel! 24 For he has not despised or disdained the suffering of the afflicted one; he has not hidden his face from him but has listened to his cry for help [ Hebrews 5:7-10 During the days of Jesus' life on earth, he offered up prayers and petitions with loud cries and tears to the one who could save him from death, and he was heard because of his reverent submission. 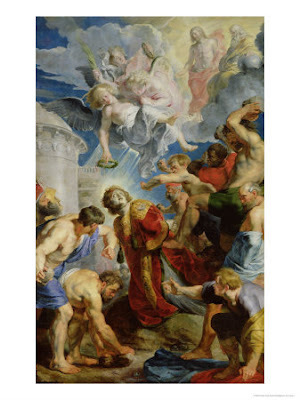 8Although he was a son, he learned obedience from what he suffered 9and, once made perfect, he became the source of eternal salvation for all who obey him 10and was designated by God to be high priest in the order of Melchizedek. ]. 25 From you comes the theme of my praise in the great assembly; before those who fear you [e] will I fulfill my vows. 17 He asked them, "What are you discussing together as you walk along?" They stood still, their faces downcast. 18 One of them, named Cleopas, asked him, "Are you only a visitor to Jerusalem and do not know the things that have happened there in these days?" 19 "What things?" he asked. 25 He said to them, "How foolish you are, and how slow of heart to believe all that the prophets have spoken! 26 Did not the Christ [Messiah] have to suffer these things and then enter his glory?" 27 And beginning with Moses and all the Prophets, he explained to them what was said in all the Scriptures concerning himself. 30 When he was at the table with them, he took bread, gave thanks, broke it and began to give it to them. 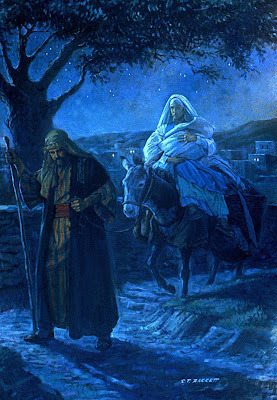 31 Then their eyes were opened and they recognized him, and he disappeared from their sight. 32 They asked each other, "Were not our hearts burning within us while he talked with us on the road and opened the Scriptures to us?" 33 They got up and returned at once to Jerusalem. There they found the Eleven and those with them, assembled together 34 and saying, "It is true! The Lord has risen and has appeared to Simon." 35 Then the two told what had happened on the way, and how Jesus was recognized by them when he broke the bread. 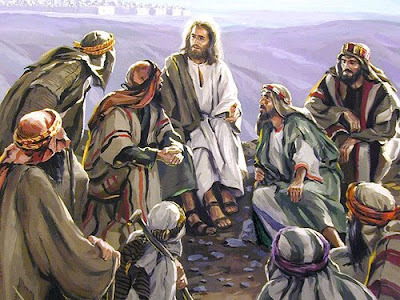 Jesus Appears to the Disciples 36 While they were still talking about this, Jesus himself stood among them and said to them, "Peace be with you." 45 Then he opened their minds so they could understand the Scriptures. 46 He told them, "This is what is written: The Christ will suffer and rise from the dead on the third day, 47 and repentance and forgiveness of sins will be preached in his name to all nations, beginning at Jerusalem. 48 You are witnesses of these things. 49 I am going to send you what my Father has promised [the Holy Spirit ]; but stay in the city until you have been clothed with power from on high." 36 "Therefore let all Israel be assured of this: God has made this Jesus, whom you crucified, both Lord and Christ [Messiah] ." 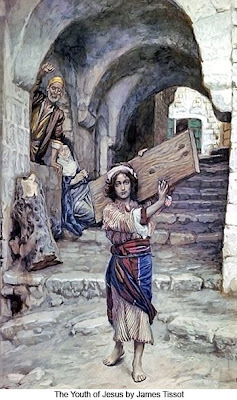 11 While the beggar held on to Peter and John, all the people were astonished and came running to them in the place called Solomon's Colonnade. 12 When Peter saw this, he said to them: "Men of Israel, why does this surprise you? Why do you stare at us as if by our own power or godliness we had made this man walk? 13 The God of Abraham, Isaac and Jacob, the God of our fathers, has glorified his servant Jesus. You handed him over to be killed, and you disowned him before Pilate, though he had decided to let him go. 14 You disowned the Holy and Righteous One and asked that a murderer be released to you. 15 You killed the author of life, but God raised him from the dead. We are witnesses of this. 16 By faith in the name of Jesus, this man whom you see and know was made strong. It is Jesus' name and the faith that comes through him that has given this complete healing to him, as you can all see. 'The Lord your God will raise up for you a prophet like me from among your own people; you must listen to everything he tells you. 23 Anyone who does not listen to him will be completely cut off from among his people.'[Deut. 18:15,18-19] See in context directly below . 24 "Indeed, all the prophets from Samuel on, as many as have spoken, have foretold these days. 25 And you are heirs of the prophets and of the covenant God made with your fathers. He said to Abraham, 26 When God raised up his servant [Jesus] , he sent him first to you to bless you by turning each of you from your wicked ways." Deuteronomy 18:15-19 Was written about 1500 years prior to Jesus' birth. 15 The LORD your God will raise up for you a prophet like me from among your own brothers. You must listen to him. 16 For this is what you asked of the LORD your God at Horeb on the day of the assembly when you said, "Let us not hear the voice of the LORD our God nor see this great fire anymore, or we will die." 17 The LORD said to me: "What they say is good. 18 I will raise up for them a prophet like you from among their brothers; I will put my words in his mouth, and he will tell them everything I command him. 19 If anyone does not listen to my words that the prophet speaks in my name, I myself will call him to account. The priests and the captain of the temple guard and the Sadducees came up to Peter and John while they were speaking to the people. 2 They were greatly disturbed because the apostles were teaching the people and proclaiming in Jesus the resurrection of the dead. 3 They seized Peter and John, and because it was evening, they put them in jail until the next day. 4 But many who heard the message believed, and the number of men grew to about five thousand. 12 Salvation is found in no one else, for there is no other name under heaven given to men by which we must be saved." 13 When they saw the courage of Peter and John and realized that they were unschooled, ordinary men, they were astonished and they took note that these men had been with Jesus. 14 But since they could see the man who had been healed standing there with them, there was nothing they could say. 15 So they ordered them to withdraw from the Sanhedrin and then conferred together. 16 "What are we going to do with these men?" they asked. "Everybody living in Jerusalem knows they have done an outstanding miracle, and we cannot deny it. 17 But to stop this thing from spreading any further among the people, we must warn these men to speak no longer to anyone in this name." 18 Then they called them in again and commanded them not to speak or teach at all in the name of Jesus. 19 But Peter and John replied, "Judge for yourselves whether it is right in God's sight to obey you rather than God. 20 For we cannot help speaking about what we have seen and heard." 27 Indeed Herod and Pontius Pilate met together with the Gentiles and the people[e] of Israel in this city to conspire against your holy servant Jesus, whom you anointed. 28 They did what your power and will had decided beforehand should happen. 29 Now, Lord, consider their threats and enable your servants to speak your word with great boldness. 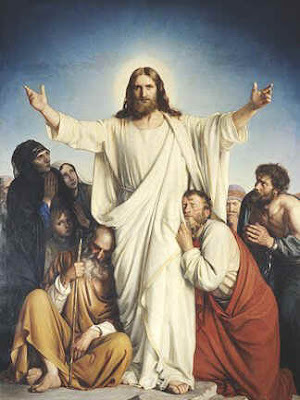 30 Stretch out your hand to heal and perform miraculous signs and wonders through the name of your holy servant Jesus." 8 Now Stephen, a man full of God's grace and power, did great wonders and miraculous signs among the people. 9 Opposition arose, however, from members of the Synagogue of the Freedmen (as it was called)—Jews of Cyrene and Alexandria as well as the provinces of Cilicia and Asia. 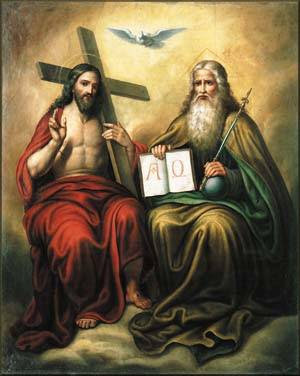 These men began to argue with Stephen, 10 but they could not stand up against his wisdom or the Spirit by whom he spoke. 11 Then they secretly persuaded some men to say, "We have heard Stephen speak words of blasphemy against Moses and against God." 12 So they stirred up the people and the elders and the teachers of the law. They seized Stephen and brought him before the Sanhedrin. 13 They produced false witnesses, who testified, "This fellow never stops speaking against this holy place and against the law. 14 For we have heard him say that this Jesus of Nazareth will destroy this place and change the customs Moses handed down to us." 15 All who were sitting in the Sanhedrin looked intently at Stephen, and they saw that his face was like the face of an angel. Acts 7: 1-60 Stephen's Speech to the Sanhedrin 1 Then the high priest asked him, "Are these charges true?" 2 To this he replied: "Brothers and fathers, listen to me! . 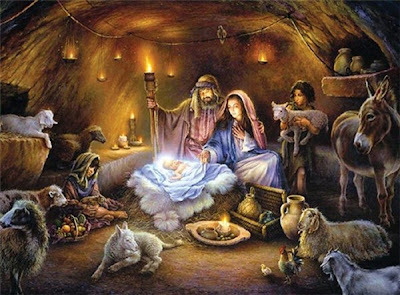 . .
20 "At that time Moses was born, and he was no ordinary child.For three months he was cared for in his father's house. 21 When he was placed outside, Pharaoh's daughter took him and brought him up as her own son. 22 Moses was educated in all the wisdom of the Egyptians and was powerful in speech and action. 27 "But the man who was mistreating the other pushed Moses aside and said, 'Who made you ruler and judge over us? 28 Do you want to kill me as you killed the Egyptian yesterday?' 29 When Moses heard this, he fled to Midian, where he settled as a foreigner and had two sons. 30 "After forty years had passed, an angel appeared to Moses in the flames of a burning bush in the desert near Mount Sinai. 31 When he saw this, he was amazed at the sight. As he went over to look more closely, he heard the Lord's voice: 32 'I am the God of your fathers, the God of Abraham, Isaac and Jacob.' 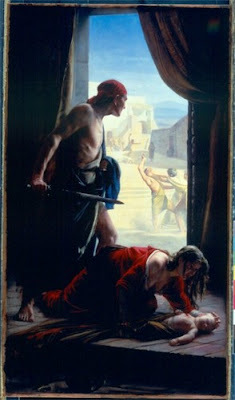 Moses trembled with fear and did not dare to look. 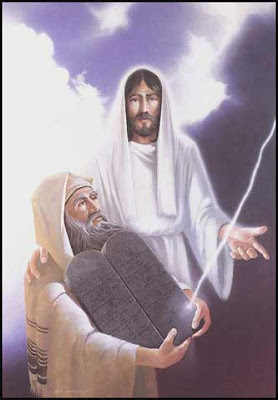 35 "This is the same Moses whom they had rejected with the words, 'Who made you ruler and judge?' He was sent to be their ruler and deliverer by God himself, through the angel who appeared to him in the bush. 36 He led them out of Egypt and did wonders and miraculous signs in Egypt, at the Red Sea and for forty years in the desert. 39 "But our fathers refused to obey him. Instead, they rejected him and in their hearts turned back to Egypt. 40 They told Aaron, 'Make us gods who will go before us. As for this fellow Moses who led us out of Egypt—we don't know what has happened to him!' 41 That was the time they made an idol in the form of a calf. They brought sacrifices to it and held a celebration in honor of what their hands had made. 42 But God turned away and gave them over to the worship of the heavenly bodies. This agrees with what is written in the book of the prophets: " 'Did you bring me sacrifices and offerings forty years in the desert, O house of Israel? 43 You have lifted up the shrine of Molech and the star of your god Rephan, the idols you made to worship. Therefore I will send you into exile' beyond Babylon. 51 "You stiff-necked people, with uncircumcised hearts and ears! You are just like your fathers: You always resist the Holy Spirit! 52 Was there ever a prophet your fathers did not persecute? They even killed those who predicted the coming of the Righteous One. And now you have betrayed and murdered him— 53 you who have received the law that was put into effect through angels but have not obeyed it." The Stoning of Stephen 54 When they heard this, they were furious and gnashed their teeth at him. 55 But Stephen, full of the Holy Spirit, looked up to heaven and saw the glory of God, and Jesus standing at the right hand of God. 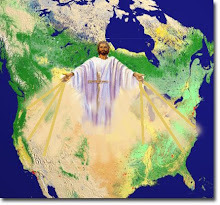 56 "Look," he said, "I see heaven open and the Son of Man standing at the right hand of God." 57 At this they covered their ears and, yelling at the top of their voices, they all rushed at him, 58 dragged him out of the city and began to stone him. Meanwhile, the witnesses laid their clothes at the feet of a young man named Saul [later became Paul the apostle] . 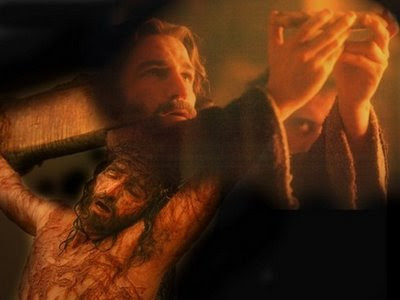 59 While they were stoning him, Stephen prayed, "Lord Jesus, receive my spirit." 60 Then he fell on his knees and cried out, "Lord, do not hold this sin against them." When he had said this, he fell asleep [died] . . . . . 15 After the reading from the Law and the Prophets, the synagogue rulers sent word to them [Paul and his companions ] , saying, "Brothers, if you have a message of encouragement for the people, please speak." 16 Standing up, Paul motioned with his hand and said: "Men of Israel and you Gentiles [Non Jews] who worship God, listen to me! 17 The God of the people of Israel chose our fathers; he made the people prosper during their stay in Egypt, with mighty power he led them out of that country, 18 he endured their conduct for about forty years in the desert, 19 he overthrew seven nations in Canaan and gave their land to his people as their inheritance. 20 All this took about 450 years. 26 "Brothers, children of Abraham, and you God-fearing Gentiles, it is to us that this message of salvation has been sent. 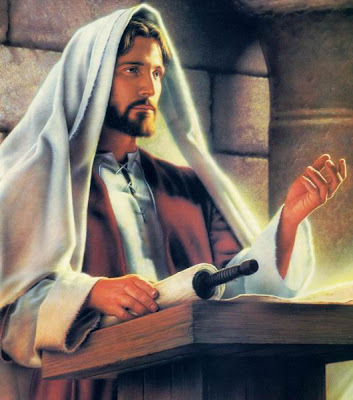 27 The people of Jerusalem and their rulers did not recognize Jesus, yet in condemning him they fulfilled the words of the prophets that are read every Sabbath. 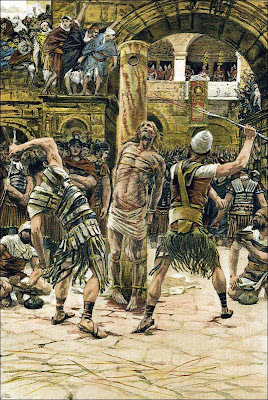 28 Though they found no proper ground for a death sentence, they asked Pilate to have him executed. 29 When they had carried out all that was written about him, they took him down from the tree and laid him in a tomb. 30 But God raised him from the dead, 31 and for many days he was seen by those who had traveled with him from Galilee to Jerusalem. They are now his witnesses to our people. 36 "For when David had served God's purpose in his own generation, he fell asleep; he was buried with his fathers and his body decayed. 37 But the one whom God raised from the dead did not see decay. someone told you. '[Habakkuk 1:5 ]"
4 "The Jews all know the way I have lived ever since I was a child, from the beginning of my life in my own country, and also in Jerusalem. 5 They have known me for a long time and can testify, if they are willing, that according to the strictest sect of our religion, I lived as a Pharisee. 6 And now it is because of my hope in what God has promised our fathers that I am on trial today. 7 This is the promise our twelve tribes are hoping to see fulfilled as they earnestly serve God day and night. O king, it is because of this hope that the Jews are accusing me. 8 Why should any of you consider it incredible that God raises the dead? . . . 22 But I have had God's help to this very day, and so I stand here and testify to small and great alike. I am saying nothing beyond what the prophets and Moses said would happen— 23 that the Christ [Or Messiah] would suffer and, as the first to rise from the dead, would proclaim light to his own people and to the Gentiles." 1 Then Joseph could no longer control himself before all his attendants, and he cried out, "Have everyone leave my presence!" So there was no one with Joseph when he made himself known to his brothers. 2 And he wept so loudly that the Egyptians heard him, and Pharaoh's household heard about it. 4 Then Joseph said to his brothers, "Come close to me." When they had done so, he said, "I am your brother Joseph, the one you sold into Egypt! 5 And now, do not be distressed and do not be angry with yourselves for selling me here, because it was to save lives that God sent me ahead of you. 6 For two years now there has been famine in the land, and for the next five years there will not be plowing and reaping. 7 But God sent me ahead of you to preserve for you a remnant on earth and to save your lives by a great deliverance. 12 "You can see for yourselves, and so can my brother Benjamin, that it is really I who am speaking to you. 13 Tell my father about all the honor accorded me in Egypt and about everything you have seen. And bring my father down here quickly." 4 . . . The oppressor will come to an end, and destruction will cease; the aggressor will vanish from the land. 5 In love a throne will be established; in faithfulness a man will sit on it— one from the house of David— one who in judging seeks justice and speeds the cause of righteousness.